What is a Vietnamese Filter? 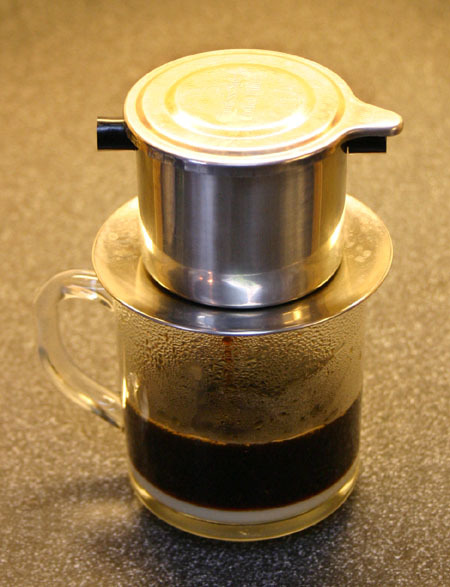 A Vietnamese filter is a small coffee pot. It looks like a hat and sits upon the top of a coffee cup. Inside is a chamber for coffee and room for hot water. It is very basic and simple, and works! 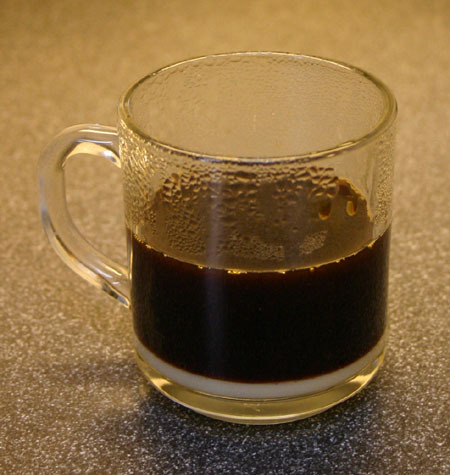 A Vietnamese filter, coffee (optionally with chicory), and condensed milk. 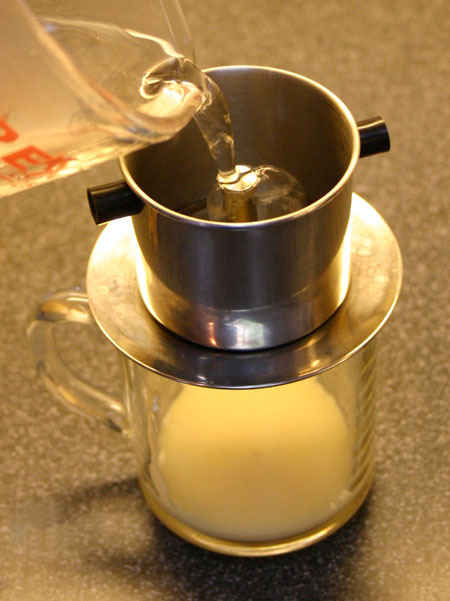 Condensed milk typically contains sugar and is heat processed with steam. Steamed milk has different physics from non-steamed milk and tastes better when used in coffee (ask any cappuccino drinker). There are two schools of thought here. My understanding is that the authentic answer is coffee with chicory. I have very successfully used canned (!) coffee from Cafe Du Monde or French Market, both available in cans in supermarkets, both are coffee and chicory. (Chicory is a caffeine-free herb whose roots are dried, ground, and roasted and is used to flavor coffee.) I also have had great luck with fresh grinding my own beans without chicory. I often use Starbucks House Blend beans that I grind between drip and French. My personal preference is sans chicory ... but then its not Vietnamese coffee. Poetic license, I guess. There is controversy here, I have read of anything from fine to coarse grind being used. The cans have what appears to be a French grind; I use a grind somewhere between French and drip. This does not fall through the holes in the filter and tastes great. 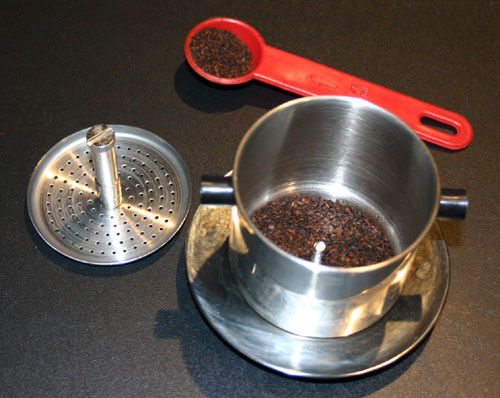 If you are new to Vietnamese coffee, use a French grind since it is easier to get it right with a coarser grind. 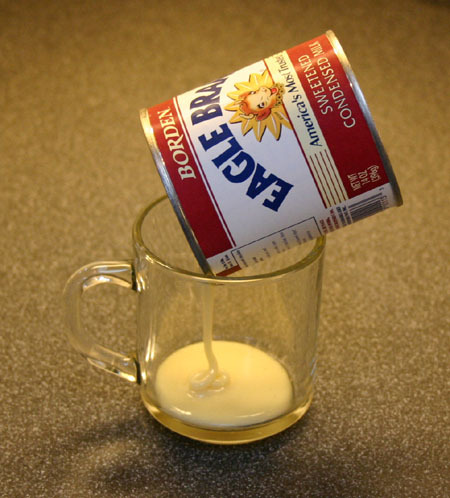 Put about 1/3 of an inch of condensed milk in the bottom of a coffee cup. I prefer a glass cup since this is cool to watch! If you store the condensed milk in the refrigerator, it will get very thick but still work fine, and your coffee will not be as hot. Open the device and unscrew to remove the filters top screen. Place three rounded teaspoons of coffee with chicory OR three and a half rounded teaspoons of coffee into the device. Replace the screen and turn it until it starts to get snug. This takes a bit of practice but note, it should not be tight but snug. 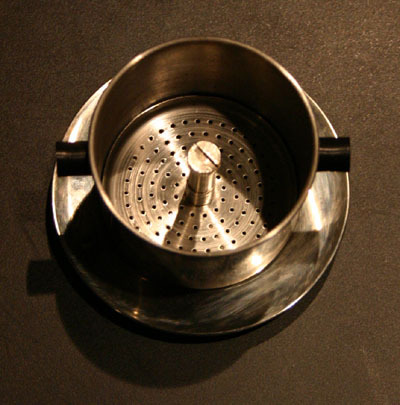 Place the filter on top of the coffee cup. 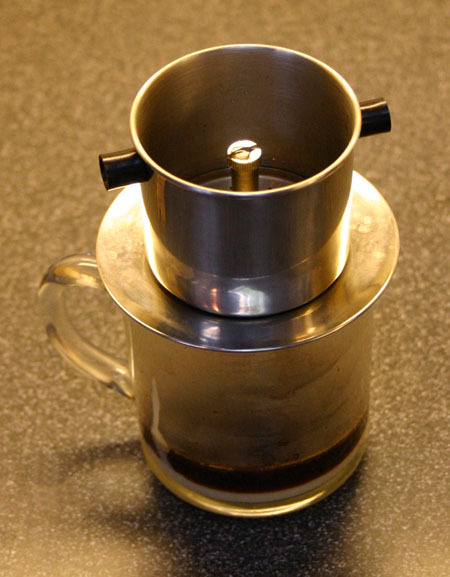 Pour hot water into the device until it is about 1/4 full. Wait 20 seconds (yes, look at the clock). If all the water flows through in the time, you need to tighten the filter more. Fill the filter with hot water. Place the cover on and wait. Typically about 5 minutes. The water should not stream through, it should drip. When the dripping stops (i.e., all the water has passed through the filter), carefully remove the device, set aside, and start to enjoy. Personally, I stir up all the condensed milk, others leave it for the end. As much fun to make as it is to watch. A real treat, especially for those who enjoy their coffee strong and sweet. Water temperature is very important, see the notes in the French Press section for more information.